In this non-traditional approach to quilt making, we will use polymer clay to create individual quilt squares. Each square will have an intricate design leading to an overall beautiful, jewel-like quilt. We will take the day to explore the many surface possibilities using polymer clay. Our experimentation in clay will push the medium to the max, emphasizing a layered approach. A myriad of mixed media techniques will be used to create each handmade quilt square. 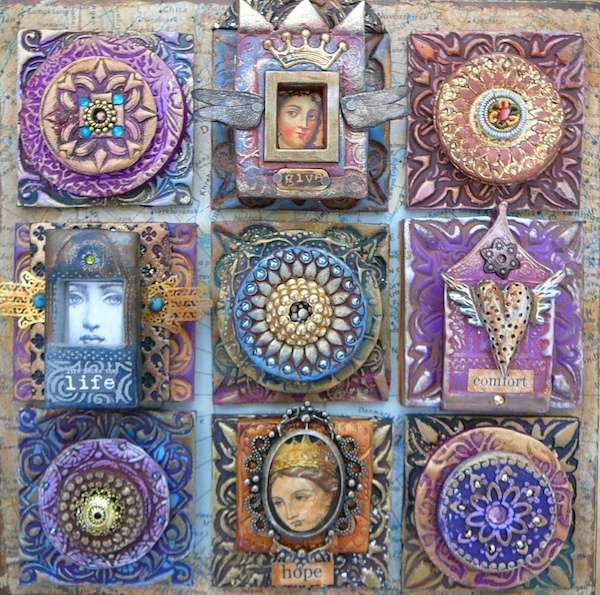 These techniques include using molds, stamping, painting the raw clay, using mica and embossing powders, gold leaf, beading and embedding metal, fabric, paper, and jewelry into the clay. By the end of the day, students will be able to arrange their squares and glue them to a substrate to create a clay quilt masterpiece! No previous clay experience necessary. Your lunch and indoor shoes. 5 or 6 (2 ounce) packages of either Premo or Sculpey III polymer clay-an assortment of related colors. Make sure the clay is soft to the touch, if it is rock hard, don’t buy it! Please condition the clay prior to class by kneading it until softened and then place it in a baggie. Doo-Dads-like beads, charms, jewelry parts, rhinestones, rhinestone chain, ball chain, metal findings, wings, crowns, buttons and tiny frames. Skill Level : No experience required-beginners welcome! Registration is now open. To reserve your seat you will be required to mail Elitia a postdated cheque for August 1, 2017 to reserve your seat. Unfortunately, no refunds on cancellation after August 7, 2017 – a credit will be applied to future workshops at my home studio.